Looking at the temperatures in Europe in general and the Barcelona area in particular, it's not going to be very warm for the first tests, I wonder whether this will have an adverse effect on the proceedings, same for everyone though. I thought they had considered testing in Bahrain since it was so cold last year. Maybe I was dreaming. What time,do we have the shakedown tomorrow ?? nothing yet but early morning looks to be cold....so sometime around noon to afternoon would be my guess. Last edited by jgonzalesm6; 25th February 2018 at 09:06. It usually starts at 9.00 local time but I don't know if the weather will play a part. 30 min. to go live testing!!!! The test is delayed for 10 mins. Weather related issue? Kimi will out first, btw. 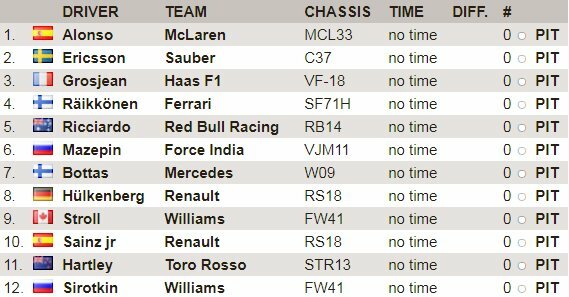 LOL, McLaren one lap then an unplanned return with mechanics running everywhere and donning the insulating gloves - perhaps an ERS problem. They can't even blame Honda now. How are you following testing? Yep, Skysports News. It's not on the F1 channel as I get it. Anyone know of any service covering all of practice?